An effective social media presence can craft brand awareness. at very little cost. Your social media presence allows you to connect with billions of budding customers across the globe. It allows you the opportunity to reach your spectators in an milieu where they have mostly let their guard down. We are so used to being shelled by commercials on the radio and on TV that many of us subconsciously tune them out. We love to connect and that is what social media is all about-connecting. Twitter, Facebook, LinkedIn, and YouTube may be new mediums, but they are simply the 21st human function. An effective social media presence connects you to your customers. 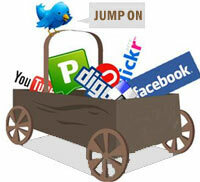 A business that is active on social media will often interact with customers or clients several times each week. Whether it is "liking" something they posted on Facebook or them simply reading an informative Tweet you publish on Twitter, an active social media existence keeps you on the mind of your customers. century tool for achieving an essential. 1. Social media sites like Facebook, LinkedIn, and Google+ can be high efficiency platforms that serve as a hub for all your social media engagement activities. 2. Video and photo sharing sites such as YouTube, Flickr, and Instagram can be sources to archive content that is distributed through other channels.